Went for an odd sort of bike ride today. I rode with Hank Walther on his RailRider. 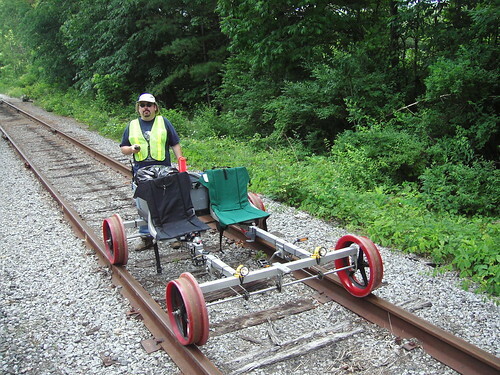 It's a quadcycle (four wheels) with rail wheels rather than road wheels, and it's built to standard gauge. So, with permission of the Upper Hudson River Railroad general manager, Cliff Wells, we rode from Riparius Station (currently the southern-most end of their excursion trains) south to Thurman Station (which is currently just a siding and wheelchair ramp, as the station itself has been gone for some time). Not only was it an odd bike, but Hank added an electric motor to it, so we were able to cruise along at speeds up to 22 mph without pedaling one bit.